Australia’s economy has softened, with the growth rate having dropped to 0.3 percent for the September quarter (2.8% annual growth rate) and CPI inflation edging down to 1.8% in the December quarter, below the Reserve Bank of Australia’s official target band of 2-3%. The official unemployment rate remained at 5%. The RBA Shadow Board continues to favour holding the cash rate constant but the uncertainty surrounding its policy recommendation reflects the slight weakening of economic data. More specifically, the Board attaches a 56% probability that holding interest rates steady at 1.5% is the appropriate setting, while the confidence in a required rate hike equals 41% and in a required rate cut equals 3%. According to the ABS, the seasonally adjusted unemployment rate in Australia remains low, at 5%; the labour force participation rate remains at 65.6%. No new data on nominal wage growth is available since the September quarter figure of 2.3% (annualised). The lower CPI inflation rate may well be matched by lower nominal wage growth (to be announced on 20 February) as there is little indication that the relatively low unemployment rate, which increasingly masks underemployment due to growing part time employment, is exerting upward pressure on wages. The Aussie dollar (relative to the US dollar), after piercing the psychologically important floor of 70 US¢, has bounced back to around 73 US¢. Yields on Australian 10-year government bonds have fallen considerably, to 2.2%. The new year has seen the Australian share market make steady gains, from a recent low of 5,400 in the S&P/ASX 200 stock index, to 5,900. There are increasing signs that the global economy may weaken in 2019, even if many countries’ stock markets experienced the usual January rally. In the US, the fiscal boost from Trump’s tax cuts will likely fade, while parts of Europe are flirting with, or already in, recession, i.e. Italy. China’s economy also appears to be slowing, albeit only slightly. Other emerging markets are also stuttering, due to factors ranging from political instability (e.g. Latin America) to unsustainable debt (Asia). Heightened trade tensions between the US and China and security concerns add to the overall uncertainty about the global economic climate. Consumer confidence has fallen; the Westpac Melbourne Institute Consumer Sentiment Index dipped below 100 this month, whereas retail sales remain unchanged. Business confidence, according to the NAB business confidence index, is the lowest it has been in three years. On the other hand, the manufacturing PMI has increased in January, while the services PMI dropped slightly. Capacity utilisation increased to above 82%. The real estate sector is noticeably weakening. Building permits are down 9.1% in November, the most recent figure. All other housing indicators, including the construction PMI, construction output, and the housing index, are down. A continuation of this decline will likely affect Australian households’ consumption and investment behaviour and therefore will be monitored closely by the RBA. That said, house prices, despite the recent retreats, are still much higher than they were three years ago, and a measured correction should be welcomed. 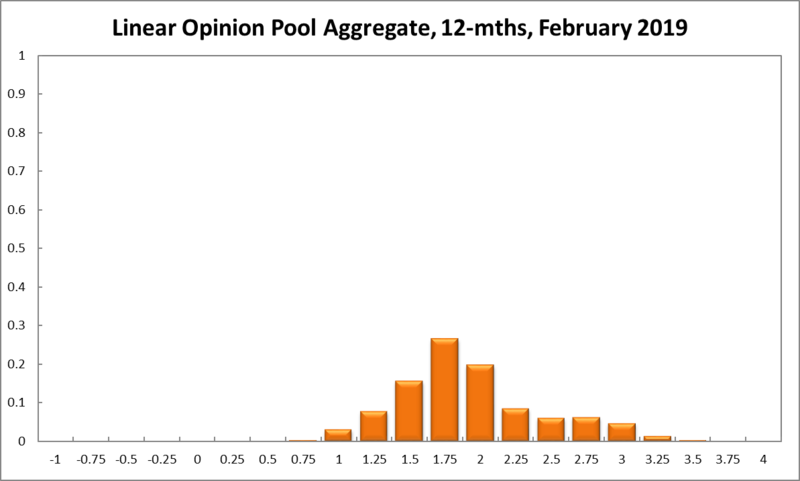 The distribution of the Shadow Board’s policy preferences continues to favour holding the interest rate constant. The Shadow Board is 56% confident that keeping interest rates on hold is the appropriate policy, up 3 percentage points from the previous month. 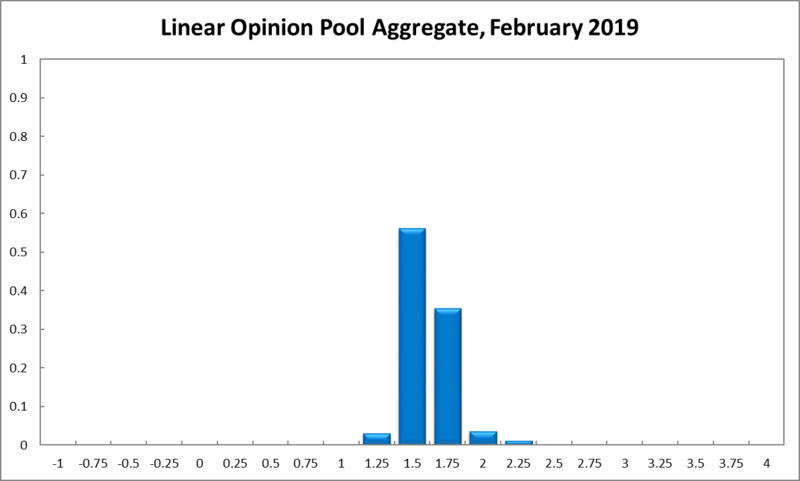 It attaches a 3% probability that a rate cut is appropriate (0% in December) and a 41% probability (47% in December) that a rate rise, to 1.75% or higher, is appropriate. 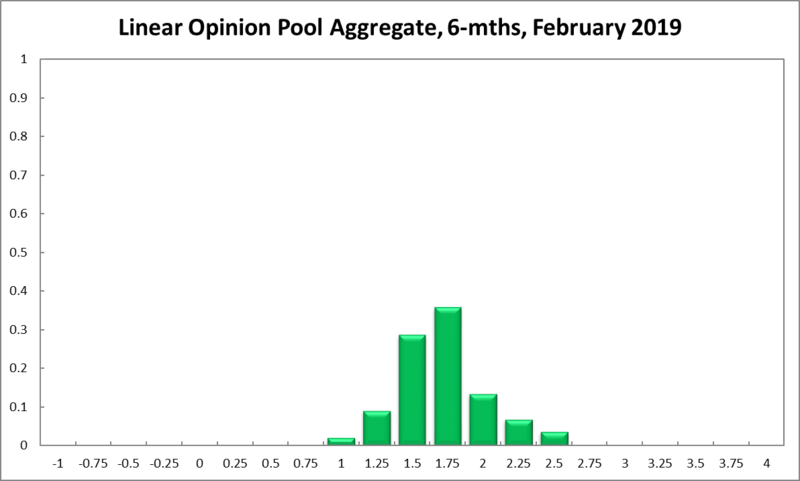 The probabilities at longer horizons are as follows: 6 months out, the estimated probability that the cash rate should remain at 1.50% equals 29%, three percentage points up from the previous round. The estimated need for an interest rate decrease has increased from 6% to 11%, while the probability attached to a required increase has fallen from 68% to 60%. The numbers for the recommendations a year out paint a similar picture. The Shadow Board members’ confidence that the cash rate should be held steady remains unchanged at 16%, while the confidence in a required cash rate decrease equals 11% (7% in December), and in a required cash rate increase 73% (78% in December). The width of the probability distributions over the 6 month and 12 month horizons remains unchanged, extending from 0.75 to 3.5.